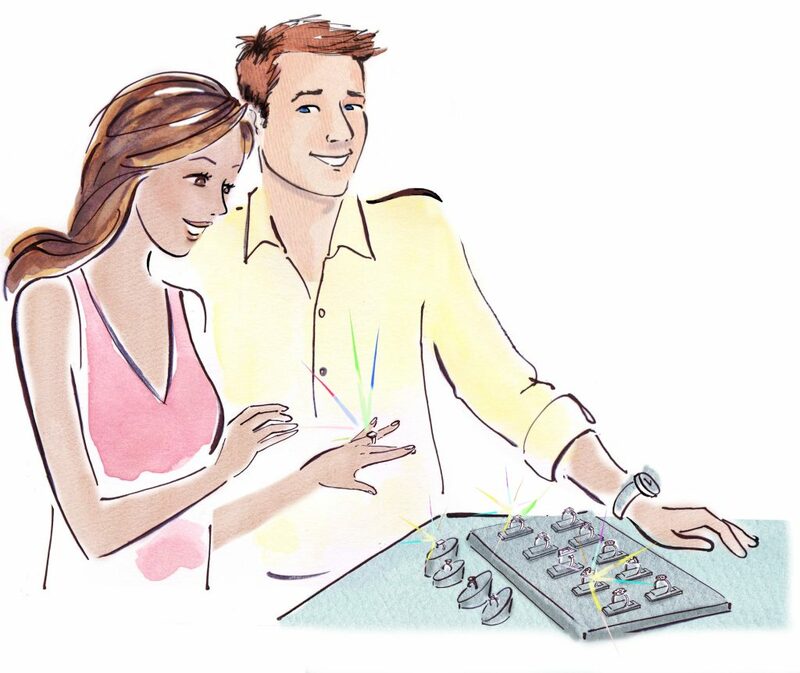 According to research, it’s almost as common for engagement rings to be bought by couples shopping together. In fact, 48% of rings are by purchased by men on their own, 44% are sold to couples browsing together and 7% to women shopping alone. We chat to the award-winning luxury retailer ROX, one of the UK’s most exciting and inspiring jewellers about engagement rings and all things sparkly. Do you dream of receiving the perfect engagement ring from a partner who knows you so well they can easily choose a ring that faultlessly reflects your style? The main consideration for brides-to-be when choosing a ring, is the overall design, with 86.2% (according to a Wedding Wire survey) placing this even over the size of the diamonds. When it comes to making the big purchase, traditional brick-and-mortar stores still get the lion’s share of business but the emergence of online shopping has made private browsing for engagement rings increasingly popular. The name diamond derives from the ancient Greek word ‘Adamas’, which roughly means unbreakable or indestructible and the Ancient Greeks believed diamonds were the tears of the gods. Natural diamonds have existed for at least 900 million years, with some being up to 3.2 billion years old. 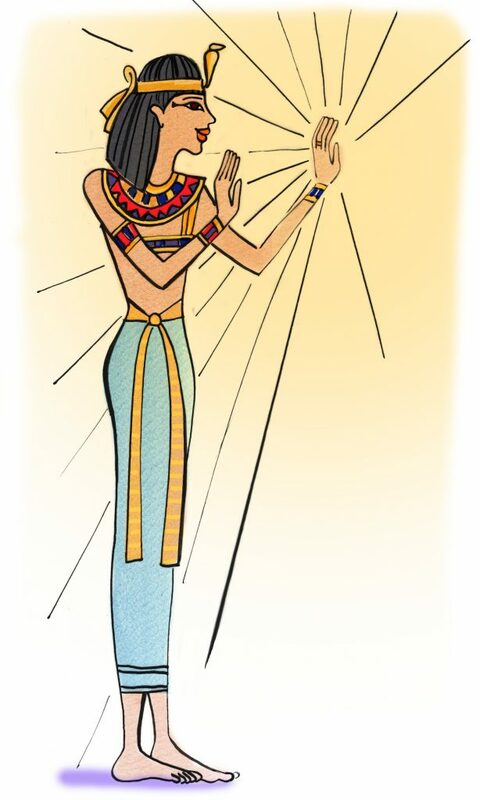 Diamonds worn in ancient times would have usually been in their natural state – the stones were believed to have protective powers that cutting the diamond would damage. One of the reasons the term “diamonds are forever” exists is because diamonds are considerably more durable than any other gemstone and rank 10 on the Mohs Scale. When visiting jewellers you will often hear about the ‘cut’ of a diamond; here they are referring to the angles and proportions that transform a rough diamond into a polished one. Based on scientific formulas, a well-cut diamond will reflect light internally and through the top of the stone – this is what causes the diamond’s sparkle! The ‘colour’ of a diamond is graded on a scale that judges how colourless the stone is, with white diamonds being the most sought after and valuable. The term ‘fancy diamond’ doesn’t refer to a diamond being sophisticated or expensive – instead, it is used to describe diamonds when their colour falls outside the normal colour range e.g. pink, blue, green and yellow. The ‘clarity’ of a diamond refers to the number and type of inclusions found within the stone that will have appeared whilst the diamond was forming. Think of them as nature’s birthmarks! Usually, the first thing that comes to mind when you talk about judging a diamond is the ‘carat’ which refers to the weight and size of the diamond. Don’t get too set on this characteristic though – bigger doesn’t always mean better when it comes to diamonds. The carat grading system is so called because originally, carob seeds were used as counterweights for a balance scale – now a metric carat is universally considered to be 200 milligrams. Along with your diamond, you’ll want the diamond ‘certification’ as well. 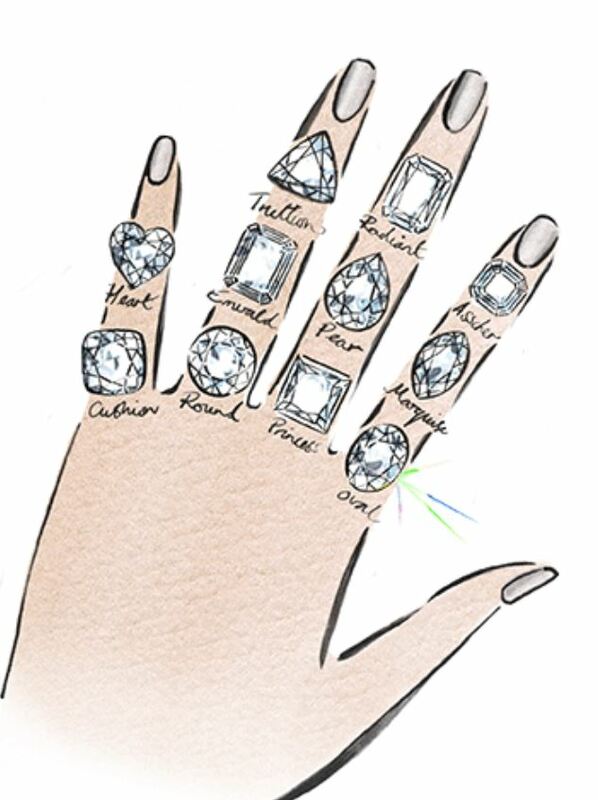 This is basically a blueprint of the diamond that details all the important characteristics of your new bling. Do you wear your sparkler to bed? While it is completely down to personal choice, catching your ring in the sheets when you’re tossing and turning can do some damage to the stone or the setting, so take care! Chemicals can also do a lot of damage to precious metals and gems, so take your engagement ring off when you’re spring cleaning and put any perfumes or body lotions on before you slip it back on, not after. Have one safe place to store your ring when you’re not wearing it, that way if it’s not on your finger there’s only one place it could be. Keep it in a fabric-lined jewellery box, or something with compartments to prevent pieces from scratching each other. You should get your engagement ring checked by a jeweller at least every 12 months so that it can be cleaned and the jeweller can spot any potential future problems like loose stones or bent settings. Wondering why you should go to the effort of heading to a jewellers for a clean? They will use professional grade cleaning solutions, high-pressure steam, ultrasonic and buffing machines to clean any dirt or oil clouding your diamond. Looking for a DIY option for the time in between your yearly visit? Our specialists suggest that in between professional cleaning you can restore your diamond ring’s brilliance by using a solution of warm water and dishwashing soap. Leave your ring soaking in the solution for around 20 minutes before removing, gently brushing with a soft toothbrush and then rinse. Round brilliant cut diamonds are still at the top of the list for a lot of people, but it’s becoming less surprising when someone decides to opt for something less traditional. From Anna Paquin’s moonstone ring to Cameron Diaz’s diamond studded thick gold band, the trend for the future seems to be simply to opt for whatever style of ring you love the most. We approve! As a woman who married a total of eight times in her life, Elizabeth Taylor was used to receiving stunning engagement rings. When Richard Burton originally proposed, it was with a necklace, but after a while he upgraded, making sure that the diamond was bigger than any that his new wife had received before. The Krupp/Elizabeth Taylor Diamond is a 33.19 carat Asscher cut that cost $305,000 at the time but in recent times sold for an incredible $8.8million. Famous as the actress that became a real-life princess, Grace Kelly’s fabulous emerald-cut diamond ring was actually a replacement – her husband Prince Rainier of Monaco made the swap after seeing that the engagement rings of other Hollywood stars at the time had more ‘sparkle’. It might not be as big as some of the royal engagement rings that followed it, but it’s still pretty impressive – the ring that Prince Philip gave the Queen was made using diamonds from his mother’s tiara. Speaking of royal engagements – one of the most recognisable engagement rings of all time has had two very high profile owners. Originally purchased for Princess Diana by Prince Charles, the stunning sapphire and diamond ring was later presented to Kate Middleton by Prince William who said that this was his way of making sure his late mother didn’t miss out. It isn’t as iconic as some of the other rings mentioned in this section, but Rebecca Romijn’s beautiful ring is unusual enough that we had to include it – the 6-carat yellow diamond is set so that it dangles from the band. The marriage might have been short lived, but the ring given to Marilyn Monroe by baseball star Joe DiMaggio remains a classic – a simple platinum band set all the way around with 35 baguette-cut diamonds. One of the most expensive engagement rings of all time, the ring that Jay Z gave to Beyoncé is valued at $5 million and features an 18-carat flawless diamond on a split shank setting. What could be better than one gorgeous engagement ring? 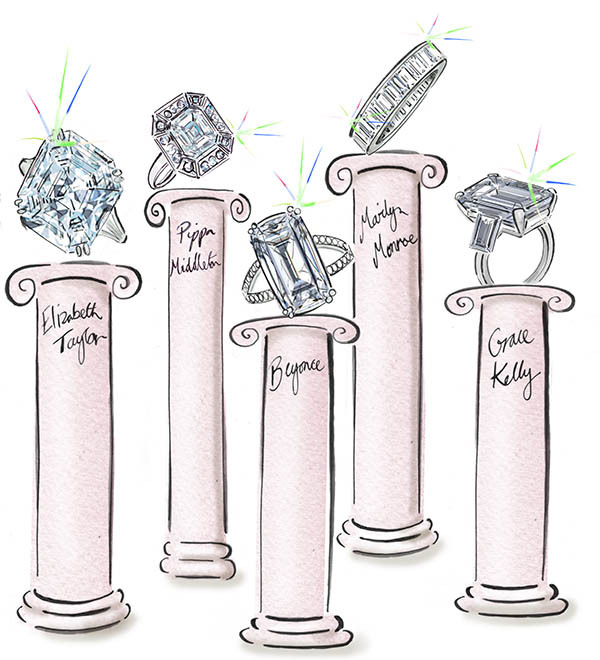 According to Victoria Beckham– as many gorgeous engagement rings as possible! Her collection of bling includes diamonds, rubies, emeralds and sapphires with a combined estimated value of $6.5 million. According to Scottish Wedding Directory, the halo engagement ring is here to stay, check out Pippa Middleton’s gorgeous £250,000 art deco–inspired sparkler. The beauty lies in its vintage style teamed with modern setting and metals; appealing to brides who want the best of both worlds. No matter what you choose for an engagement ring, whether that be a diamond, ruby, sapphire or other precious gemstones, an engagement ring is so much more than just another piece of jewellery. This sparkly symbol of commitment is exceptional and as diamond experts, we know what it takes to spot a beautiful diamond. Every ROX diamond engagement ring is handpicked for its superior cut, presence and beauty. We only ever select a small proportion of those diamonds that reach our fanatical standards for beauty and brilliance. The qualities of ROX diamonds are reflected in the company’s ethos. There’s clarity, there’s substance and there’s individuality. Our loyal customers are given the red carpet treatment from the moment they set foot in a ROX store – from stunning contemporary design to the inviting leather lounge chairs and the unrivalled level of personalised customer service, ROX aims to make you feel like an A-list celeb. ROX stores are designed to make you feel equally comfortable with asking for advice or being left alone to consider your purchase privately over a complimentary glass of champagne or chilled beer.